Prepare top-notch meals for friends and family with these best stoves and cooktops. “This gas range and oven combo packs in a lot of features for the price tag." “There are five powerful burners and the convection oven features a roller rack." “Incredibly versatile and can handle cooking and baking multiple dishes at once." This Samsung gas range and oven combo packs in a lot of features for the price tag. If you love to throw big holiday gatherings and dinner parties galore, you're in luck. The large 5.8 cubic foot convection oven with two racks can accommodate a big roast, multiple side dishes or several sheets of cookies all at once. The unit heats up quickly and cooks very evenly, according to users. As for the stovetop, five burners that are all slightly different sizes provide flexibility for cooking, while grate marks point out the best place to put pots and pans for optimal results. The unit comes with a griddle for the center burner, too, so you can whip up bacon and eggs in a jiffy. A 17,000-BTU power burner is ideal for boiling water quickly. You will have to wait for the grates to cool off to wipe them down, so cleanup will take a bit longer than on a smooth-top stove. Samsung backs this appliance with a one-year warranty on all parts and a five-year warranty on the cooktop. 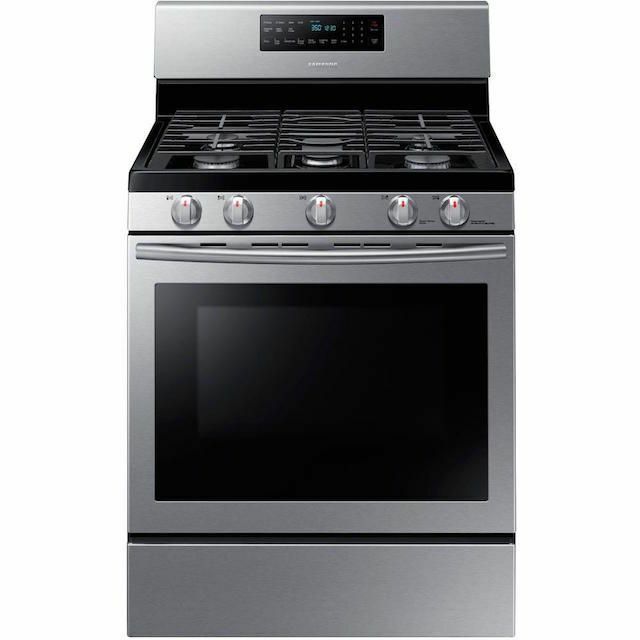 This stainless steel gas range from GE gets high marks all around for its features and functionality. From its sleek, modern look to its abundance of options, this stove will take your cooking to a whole new level. There are five powerful burners in all (powered by a 20,000 BTU tri-ring burner), the one in the middle being a large rectangular burner that’s perfect for a griddle or other large pots and pans. The convection oven features a roller rack, so pans glide in and out with ease, and there’s also a warming drawer at the bottom. It’s 30 inches wide, and GE guarantees it will slide right in if you’re looking to replace your old one of the same size. Customers say this stove performs well and particularly love the powerful burners and the griddle. 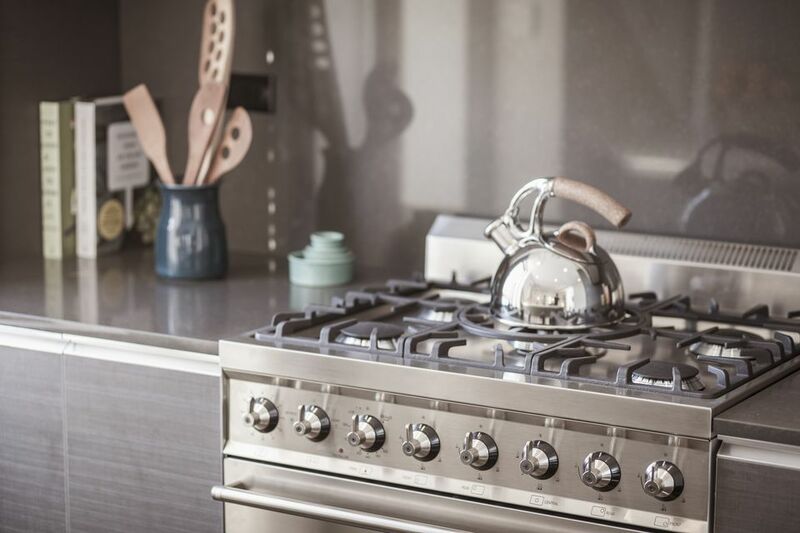 If you want a range that is incredibly versatile and can handle cooking and baking multiple dishes at once, you'll want to consider this gas range from GE. In addition to the normal four burners on the stovetop, there is also a central oval-shaped burner that comes with a griddle. It's perfect for making grilled cheese sandwiches, cooking bacon, or flipping pancakes. The burners also have two separate rings of flame, meaning you can turn on the center one for a low simmer or fire them both up for full heat. A 20,000-BTU power boil burner helps ensure you won’t wait too long to boil water. The convection oven portion of the range doesn't disappoint either, with two separate oven compartments making it easy to cook different dishes at different temperatures. A delay bake feature even allows cooks to turn on the oven at a preset time. If you like to entertain and need lots of cooking space, this range is a great choice. GE provides a one-year warranty. If you’re on the market for an electric range for your kitchen, this 6.4-cubic-foot stainless steel stove from Whirlpool has all the features you could ever want. In addition to its electric cooktop and convection oven, this product has a convenient self-cleaning option, and it all comes at a reasonable price. The oven’s ceramic glass cooktop features five heating elements, including two FlexHeat burners that offer various heating ring sizes. Down below, the convection oven uses a temperature management system to ensure even cooking, and its extra-large window allows you to monitor your food without letting out any precious heat. There are two oven racks included, and you can arrange them in seven different positions. Cleaning your oven has never been easier than with this electric range. Not only does it have a self-cleaning feature that uses just water to remove baked-on food, but it also has a hidden baking element that makes it super easy to wipe down. Overall, this highly-rated electric range has ample room for your cooking and baking needs, a convenient cleaning option, and an unbeatable price. If you’re in the market for a new range, the Whirlpool 6.4 cu. ft. Electric Range should definitely be a contender. You don’t have to pay an arm and a leg for a high-quality range. The GE 5.3-cubic-foot Electric Range has all the basic functionality you want in your kitchen, yet it’s hundreds of dollars cheaper than many other stoves. On top of this stove, you’ll find four coil heating elements, each of which has a chrome drip bowl to make cleanup easier. The range’s oven can accommodate several dishes with its two racks and six varying positions. You can easily broil food in this oven, or even set a delayed bake time so dinner is always ready when you want it. Additionally, the range boasts a “Big View” oven window so you can check on your food and a self-cleaning feature to help keep the oven cavity spotless. If you’re looking for a quality electric range on a budget, this no-frills model certainly fits the bill. It has all the features you need in a modern kitchen—multiple heating elements, a spacious oven, broil and delayed bake options, and self-cleaning mode—with an affordable price tag. If you’re a renter or just want a cooktop that you don’t have to install, this portable induction cooktop from Secura is exactly what you need. The highly-rated product is lightweight and portable, and users rave about how quickly it can boil water and heat up food. It’s important to understand the difference between a standard cooktop and an induction cooktop before you purchase this product. The surface elements on an induction cooktop use an electromagnetic field to produce heat, which means you must cook with pots made of a magnetic material like stainless steel or cast iron. This unique way of cooking allows for speed and precision in the kitchen. The Secura Portable Induction Cooktop is a countertop unit that you plug into a standard outlet. It’s easy to store and move around, and it features a single induction burner with a temperature range from 140 to 460 degrees Fahrenheit. You use a digital control panel to adjust the heating element, and there’s even a built-in digital timer and an automatic shut-off feature for safety. If you’re interested in trying induction cooking or are looking for a portable cooktop for your home, this product is highly affordable and delivers amazing results in the kitchen. For an amazing gas cooking experience, you should look into this 30" gas cooktop from Whirlpool. This highly-rated product has a sleek stainless steel exterior, and it features several convenient features to make cooking and cleaning easier than ever. You’ll need about 4" of cutout height to install this cooktop in your counter, but it’s wall-oven compatible for added convenience. As you might expect from its name, this Whirlpool cooktop has five burners, including one in the middle for increased flexibility. Each of the burners has FlexHeat technology, meaning they have two rows of flames: one row with high flames for fast heating and another with smaller flames to ensure even cooking. You can adjust the temperature of the burners with the control knobs, getting just the heat you need for a perfect meal. No one likes cleaning heating elements, but this cooktop makes cleanup a breeze with its lift-off grates. The pieces are even dishwasher friendly, so there’s no scrubbing required. Even the cooktop’s control knobs can be put in the dishwasher! These well thought-out features make the Whirlpool 5-Burner Gas Cooktop a great option for any kitchen. Sometimes you can only fit a smaller cooktop say in a condo or apartment and that is where the 24" Electric Radiant Cooktop from Summit will fit in nicely. Though it is small in size it does still have many of the features larger counterparts have like lights to alert you when the top is on (but not when it is hot) and push to turn knobs that prevent it turning on accidentally. Reviewers comment that this has fit in nicely in their small space and the price is great for what you get. For all those times when you’re cooking various dishes that require different temperatures or you don’t want to heat up the whole oven just for a small dish, this double oven will save the day. Instead of one large oven, it’s split into two convection ovens, the temperature of each which can be controlled separately. The oven’s full capacity is 5.9 cubic feet, with 2.7 cubic feet of space in the upper oven and 3 cubic feet of space in the lower. There’s also a warming drawer at the bottom. Up top are five burners, including a large oval one in the middle to accommodate larger pots and pans. The clear majority of customers rave about this range and say it looks and cooks great, and they love the flexibility it offers. Some, however, have reported problems with keeping it clean, as they say spots show up easily. Need some more help finding what you're looking for? Read through our article on the best smooth-top stoves and cooktops.